• Clostridium difficile-associated diarrhea (CDAD) has been reported with use of nearly all antibacterial agents, including Cleocin, and may range in severity from mild diarrhea to fatal colitis. Treatment with antibacterial agents alters the normal flora of the colon, leading to overgrowth of C. difficile. • Because Cleocin therapy has been associated with severe colitis that may be fatal, it should be reserved for serious infections for which less toxic antimicrobials are inappropriate. It shouldn't be used in patients with non-bacterial infections such as most upper respiratory tract infections. • C. difficile produces toxins A and B, which contribute to the development of CDAD. Hypertoxin-producing strains of C. difficile cause increased morbidity and mortality because these infections can be refractory to antimicrobial therapy and may require colectomy. CDAD must be considered in all patients who present with diarrhea following antibiotic use. Careful medical history is necessary because CDAD has occurred more than 2 months after administration of antibacterial agents. • If CDAD is suspected or confirmed, ongoing antibiotic use not directed against C. difficile may need to be discontinued. Appropriate fluid and electrolyte management, protein supplementation, antibiotic treatment of C. difficile, and surgical evaluation should be instituted as clinically indicated. Apply a thin film of topical gel, lotion, or solution locally to affected area b.i.d. • Give oral doses with full glass of water, with or without food. ☞ Don't give as I.V. bolus injection. • Dilute I.V. 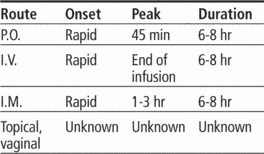 solution to a concentration of 18 mg/ml using normal saline solution, dextrose 5% in water, or lactated Ringer's solution. Infuse no faster than 30 mg/minute. • Don't administer I.M. dosages above 600 mg.
• Inject I.M. doses deep into large muscle mass to prevent induration and sterile abscess. • Monitor creatinine level closely in patients with renal insufficiency. • Monitor hepatic enzyme levels in patients with hepatic disease. • Assess for signs and symptoms of hypersensitivity reactions, including anaphylaxis. • Assess for diarrhea and signs and symptoms of colitis. • Tell patient to take drug with food if it causes stomach upset. ☞ Urge patient to contact prescriber immediately if he develops rash, unusual fatigue, or yellowing of skin or eyes or if diarrhea occurs during or after treatment. • Tell patient that I.V. use may cause bitter taste. Reassure him that this effect will resolve on its own. • Caution patient not to rely on condoms or diaphragm for contraception for 72 hours after using vaginal preparation; drug may weaken latex products and cause breakage. • Instruct patient taking hormonal contraceptives to use supplemental birth control method, such as condoms (unless she's using a vaginal preparation); drug may reduce hormonal contraceptive efficacy. indications It is prescribed in the treatment of certain serious bacterial infections (including anaerobic and some gram-positive organisms). contraindication Hypersensitivity to this drug or to lincomycin prohibits its use. adverse effects Among the more serious adverse reactions are pseudomembranous colitis, severe GI disturbances, and hypersensitivity. An antibiotic drug that treats infections with gram-positive and anaerobic organisms. Like other antibiotics, it may alter the flora of the gastrointestinal tract, leading to pseudomembranous colitis caused by overgrowth of Clostridium difficile. It is important to note, however, that while this study investigated chloroform solutions containing clindamycin hydrochloride and rifampicin, the process as described provides a broad and important platform suitable for numerous other antibiotic drugs and active pharmaceutical ingredients. These birds received clindamycin hydrochloride at 100 mg/kg administered by gavage q6h for 5 doses to reach steady-state plasma concentrations. Efficacy of clindamycin hydrochloride capsules for the treatment of deep pyoderma due to Staphylococcus intermedius infection in dogs. The combination of quinine sulfate and clindamycin hydrochloride for treatment of a newborn with transfusion-associated babesiosis was described in 1982 and subsequently became the first accepted treatment (7).